I have only 10 days left of break until the summer session starts. Only 10 days. So I've been World Market-ing. I love World Market. It's one of those places that just has about everything you could ever want. I always try a new drink at the end of my World Market experience. They always have the craziest stuff. So naturally I needed to be cultured, and rightful so because this drink is so refreshing. These mugs. Yes, I could have gotten better more sophisticated mugs. BUT these spoke to me. I can't help it. Look how regal that ostrich looks. These really help on a 12 hour shift. Or at least that's what I tell myself! You can also get these at Trader Joes, another love of mine. This ostrich mug needed another debut, right next to some awesome tea, I haven't tried all of them, but the peach ginger tea is pretty good. I've also never told you about my love of Newk's. OH THIS PLACE. I usually get The Italian sandwich, but then I reviewed the nutrition facts. HOLY CRAP. It was easily 1100 calories. SO, this visit, I got the Black and Bleu salad... It was really good. I didn't get the bleu cheese dressing, but I did get the balsamic vinegrette on the side. When you get a salad here they like to put the salad dressing on for you, which can leave your salad swimming in dressing. Always best to get it on the side. This is a shrimp pizza. I don't know about you, but I have never eaten shrimp on a pizza. My friend got this, and she said it was amazing. I will take her word for it! It did smell really good. I finally finished The Mockingjay. OMG. I always feel like i'm apart of the book by the end, I just couldn't believe the ending. READ IT BEFORE THE MOVIE. You'll be so glad you did. I've also started a new book: The Book Thief. I'm really liking it. I'm about a 1/3 of the way in. It has a stranger narrated part of it, which I'm sure will tie in with the end of the book. I don't work again until Saturday and Sunday night, so I will be jam-packing this week with fun stuff to make the most of this break!! 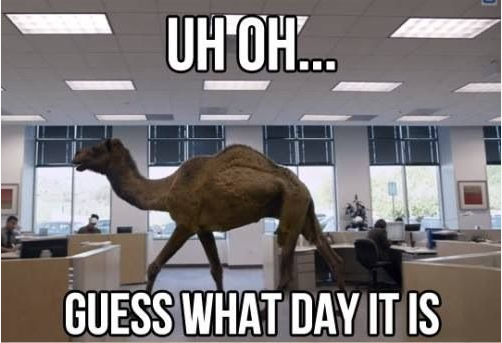 Happy Hump Day!!! I'm such a sucker for the camels on hump day. Where is your favorite go to place to go eat?! Do you have a love for World Market?